North Attleboro, 3 vs. Central Catholic, 6 – Final – North Attleboro was able to tie the game 2-2 through three innings but Central Catholic built a 6-2 lead by the seventh inning. John Brennan had an RBI single down the third base line and Zach DeMattio had an infield RBI grounder. Andy Katch capped North’s scoring with a solo home run in the bottom of the seventh. Matt Papineau pitched 5.1 innings, allowing four earned runs in a solid outing for Big Red. King Philip, 1 @ Newton North, 0 – Final – King Philip scored its lone run in the first inning and senior Kali Magane retired 21 of the 22 batters she faced, giving up a bunt single and striking out 14. Christa Wagner led off with a single, stole second and came home on an errant throw trying to get Elise Pereira out on a bunt play. Magane and Caeli Bench each had a hit while Meghan Gorman had two hits for the Warriors. Oliver Ames, 1 @ Mansfield, 2 – Final – Mansfield senior Bri Homer scored what turned out to be the winning run in the second inning and tagged out what would have been the tying run in the top of the seventh. Homer took a relay throw from Jocelyn Reardon after a throw from Amanda Giambanco in right field. Homer was 2-2 on the day, following a walk from Liz Mackin in the second inning with a single. Marissa Staffier hit a two-run single down the right field line next to put the Hornets up. Maddie Letendre got the win on the mound, striking out eight while allowing four hits. For Oliver Ames, Jamie Gottwald was 1-2 with an RBI triple, Victoria Ziner went 2-3 with a pair of doubles and a run scored and Caroline Mahoney had a double. Freshman Kayla Georgeu struck out five and allowed five hits in six innings of work. North Attleboro, 2 vs. Bishop Feehan, 8 – Final – Abby Warren was able to keep the Shamrocks off balance for six innings but the away team plated six runs late. Kaylea Sherman went 2-3 with a pair of RBI and had an assist at the plate. Jordan Sharpe was 2-3 and Meg Barlow added a double for the Rocketeers. Canton, 6 @ Dennis-Yarmouth, 3 – Final – Canton built a 2-0 lead after a quarter and held a 5-2 advantage by halftime. Dan Nadeau moved from his normal position in defense to play midfield and found the back of the net twice. Ben O’Neill led Canton’s offense with three goals and Ryan Lodge scored once. King Philip, 8 @ Walpole, 15 – Final – King Philip rallied from a three goal deficit at halftime to knot the game at 7-7 but Walpole scored three straight goals in 67 seconds, stealing away the momentum and taking the win. Sam Agricola, Tim Watson, Harry Fallon and John DeLuca each scored twice for KP while Agricola, Collin DeVellis and Anthony Truini each had an assist. Oliver Ames, 10 @ Whitman-Hanson, 9 – Final (2OT) – Senior attack Matt Gilson took a feed from Owen Gallagher in the second overtime and scored his fifth goal of the game to give Oliver Ames the win. Gilson’s five goals were complemented by a pair of goals and assists from Gallagher, two goals from Eric LeBlanc and a goal from senior Aidan Connly. Senior Jake Aronson made 17 saves in the cage for Oliver Ames. Taunton, 8 @ Canton, 2 – Final – Senior Charles Hearrold III had another strong outing for the Tigers, allowing just one earned in in five innings of work, scattering four hits with six strikeouts. The Tigers’ offense was led by Matt Machado (two hits, three runs), Kevin Griffin (two hits, RBI) and Luke Figueira (two hits, two RBI, run). King Philip, 8 @ Foxboro, 1 – Final – Jake Lannigan shined on the mound for the Warriors, scattering three hits without surrendering an earned run in a complete game effort. Lannigan struck out six to earn the win. Offensively, Will Weir drove in three runs, Stephen Murray connected for a two-run home run and Jon Rolfe also knocked in a pair of runs. Kyle Guenthner picked up two of King Philip’s nine hits on the day. Franklin, 0 @ Stoughton, 3 – Final – Doug Seaman broke a scoreless game open in the fourth inning by hitting a single, advancing to second on an error, stealing third and coming home on a hit from junior Jack Connelly (2-3). Seaman (2-3) produced the next two runs for the Black Knights with a two RBI single in the next inning to cap the scoring. For the second straight start, Justin Hutchinson was on point, throwing a complete game with just two hits allowed, striking out eight for the win. Franklin sophomore Jason Ulrickson was strong in his first varsity start, throwing six innings and giving up just four hits, two earned runs and struck out four. Junior Ryan Hodgkins went 2-3 at the plate for the Panthers. Mansfield, 3 @ Sharon, 0 – Final – Click here for a full recap. North Attleboro, 0 @ Milford, 1 – Final – It was a classic pitcher’s duel between Milford’s Alex Macek and North Attleboro’s John O’Donnell. In just his second start of the season, Macek was efficient with a complete game, 83 pitch shutout effort. Macek fanned seven batters, allowing four hits. O’Donnell was equally as good for the Rocketeers, striking out six while allowing just five hits. The difference came in the third inning when Milford sophomore Aidan Wilde smacked an RBI triple to score freshman Alex Coady, who reached on a one-out single. Canton, 0 @ Taunton, 14 – Final (5 inn.) – Courtney Fisher picked up her fourth win of the season, retiring the final 14 batters in order after allowing just one hit with no walks. With the win, the Tigers qualified for the the state tournament. Offensively, Sarah Bagge went 2-2 with an RBI, Jordan Wade was 2-4 with an RBI, a double and three runs scored, Jaime Brown went 2-4 with an RBI and two runs scored, Amber Wainwright drove in three runs and had a double and Hailey Medeiros went 1-1 with an RBI for the Tigers. Foxboro, 0 @ King Philip, 12 – Final (6 inn.) – The Warriors of King Philip recorded 15 hits as a team in a big win. Ashley Hession had a big day at the plate with three hits, including a double and a triple, and knocked in four runs. Brianna Lacy added three hits with a double and three RBI and Jenn Hutnyan had a pair of hits for the Warriors. Hutnyan combined with Kali Magane for a three hit shutout in the circle. Magane struck out 10 in four innings of work. Stoughton, 1 @ Franklin, 8 – Final – Franklin head coach Kate Fallon-Comeau praised the effort of senior pitcher Caroline D’Aprile, who tossed a complete game with nine strikeouts and five hits allowed. Offensively, Clara DeCarvalho was 1-2 with a pair of walks and an RBI double, Alexx Niss was 2/4 at the plate, Olivia DiGiacomo had a two RBI double and Kerry Blaney scored a pair of runs for the Panthers. Sharon, 0 @ Mansfield, 5 – Final – Mansfield pitcher Maddie Letendre only surrendered three hits to the Eagles, striking out 12 to earn the win. Offensively, the Hornets notched nine hits with three players getting a pair each. Maddie Letendre helped her cause by going 2-3 with an RBI, Jocelyn Reardon was also 2-3 with an RBI and Bri Homer had a pair of hits. Rachel Carafa drove in a pair of runs and had a hit, Megan Letendre had one RBI and one hit and Liz Mackin also had a hit for the Hornets. 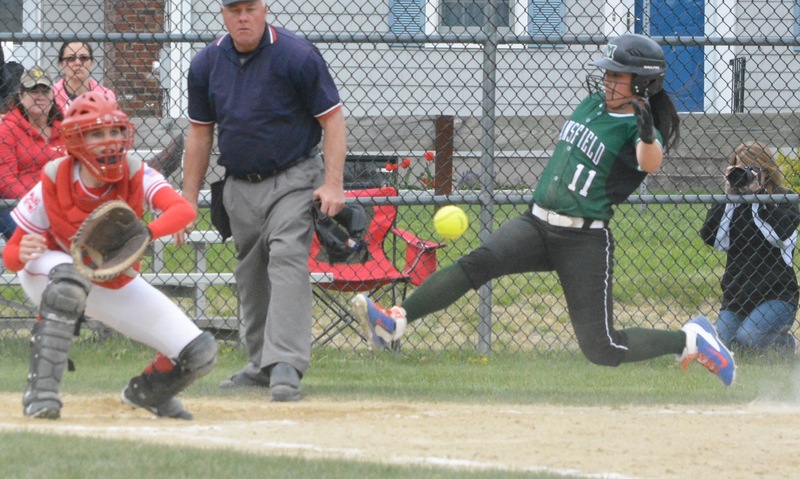 Milford, 3 @ North Attleboro, 6 – Final – Amelia Murphy got the win in the circle after seven innings of work and helped her cause at the plate, belting a three run home run as the Rocketeers handed Milford its first league loss of the season. Mycala Moody went 2-3 for North Attleboro, scoring a pair of runs while Liz Morehouse reached base three runs with one hit and two walks. Mansfield, 15 @ Taunton, 1 – Final – Senior Josh Schafer scored his first two goals of the season and classmate Preet Patel netted his first career goal to pace Mansfield. Sam O’Connell scored a hat trick and Billy Grant scored twice and had three assists. Jon Reed, Cullen Murphy, Jarrett Saunders, Joe Cox, Pat Graham, Sean Powers and Dan Plugis all scored once for Mansfield. Taunton, 2 @ Mansfield, 18 – Final – Mansfield had nine different players find the back of the net in the win on Friday. Caroline Maher led the charge with five goals while Julia Todesco scored three times and Emily Aarons scored twice. Taunton’s Abbey Kingman and Kayla Phillips eached scored once and Tatum Speicher had an assist. King Philip, 5 @ Foxboro, 0 – Final – Although it was a sweep for King Philip, it was far from a rout. Two matches went to three sets and another was decided in a super tiebreaker. Cole Ginter and Blake Ginter both won 6-1, 6-1 at first and third singles for the Warriors. Garrett Schneider battled back at second singles to score a 1-6, 6-3, 11-9 win. Sam Colella and Ryan Gemelli had to also rally, winning 4-6, 6-2, 7-6 (11-9) at first doubles while Justin Rohan and Marco DiStefano won 6-1, 4-6, 6-4 at second doubles. North Attleboro, 5 @ Milford, 0 – Final – North Attleboro won all five matches in straight sets to earn the win. Senior Mitchell Dyer won 6-3, 6-2 at first singles, junior Zack Pfeffer won 6-3, 6-3 at second singles and junior Barsomo Nuay won 6-2, 6-1 at third singles. Seniors Jeff Yao and Nick Lockavitch won 6-0, 6-2 at first singles and senior Jake Fontes and junior Daniel Zhang won 6-1, 6-2 at second doubles for the Rocketeers. Sharon, 5 @ Mansfield, 0 – Final – The Sharon Eagles scored a dominant victory on Friday, not losing a single set against the Hornets. Sophomore Lulu Yuan won 6-1, 6-0 at first singles, freshman Nupur Shulka won 6-1, 6-0 at second singles and sophomore Emily Wen won 6-0, 6-1 at third singles. Seniors Pooja Puttigampala and Michal Kondratiev won 6-1, 6-1 at first doubles and sophomore Katie Merpot and junior Sydney Gordon won 6-0, 6-0 at second doubles. Mansfield, 1 @ Attleboro, 5 – Final – Attleboro starting pitching Nolan Kane was superb in six innings of work, allowing just one unearned run. Kane struck out four and allowed just three hits to get the win. At the plate, Dakota Kirby was 3-3 with a big two RBI double in the sixth inning and Nate Tellier had a pair of hits, scored one run and had a stolen base. Attleboro head coach Matt Bosh noted that Brandon Galvao played excellent defense at first base. Matt Callahan came in and pitched a 1-2-3 seventh inning for the Bombardiers. Canton, 2 @ Stoughton, 13 – Final – Ryan Sullivan did it all for the Black Knights, picking up the win on the mound and helping his cause at the plate. Sullivan tossed five scoreless innings, allowing just one hit and a pair of walks while striking out four. At the plate, he scored three runs and knocked in a pair of runs. Luke Johnson led Stoughton’s offense, hitting a triple with the bases loaded and finished with another triple a run scored and five RBI. Jake Gibb went 2-3 with a double, two RBI and two runs scored, Doug Seaman scored two runs, Justin Hutchinson drove in a pair of runs and Nick Quattrucci also had a triple. Sharon, 4 @ Foxboro, 8 – Final – Darren Kelly and Jesse Galanti each reached base three times and came around to score three runs each to pace Foxboro’s offense. Nick Wright and Steve Couroupacis combined on the mound for seven strikeouts. Franklin, 6 @ North Attleboro, 2 – Final – Franklin used a four run seventh inning to break a 2-2 tie and secure the win. With the bases loaded and two outs, Franklin sophomore Jake Noviello’s fly ball fell in the infield for a pair of runs and Mike Skaza followed with a two run single to create the separation. North Attleboro took a 1-0 lead in the first inning behind an RBI single from Ridge Olsen, scoring Kyle McCarthy (single). The Panthers tied it up in the top of the third when Ryan Hodgkins singled, stole second and was sacrificed to third. He scored on a sacrifice fly from Nick Santucci. Franklin took the lead in the top of the fifth when Tyler Gomes singled in Hodgkins (triple). The Rocketeers quickly tied things up in the bottom of the inning behind a home run from sophomore Zach DeMattio. Hodgkins finished 2-4 with a pair of runs, Jake Lyons was 2/2 with a run and Santucci finished with three walks, a run and an RBI. Jake Noviello went six innings, striking out a pair while allowing two runs on four hits. Jason Ulrickson closed the game out for Franklin. North Attleboro’s Andy Katch was stellar in 6.2 innings of work, striking out three. Milford, 10 @ Oliver Ames, 11 – Final (12 inn.) – In a back and forth affair, Oliver Ames was able to prevail in the 12th inning. Sophomore Mitch Goulet led off the inning with a single, was sacrificed to second and the Tigers walked off on an RBI single from sophomore Matt Muir. Muir and senior Chris Romero each had three hits for the Tigers. Attleboro, 4 @ Mansfield, 6 – Final – Mansfield’s Rachel Carafa went 2-3 with an RBI, Maddie Letendre had two hits, Megan Letendre had an RBI and Kara Bendanillo and Jocelyn Reardon each had a hit for the Hornets. Maddie Letendre allowed just three hits while striking out nine for the win. Stoughton, 3 @ Canton, 2 – Final – Gina Carafa pitched well for the Black Knights, giving up one run on five hits and striking out eight for the win. Offensively, Stoughton was led by Jordan Lyons, Jenni D’Andrea and Nicole Bodette, who got a pair of hits each. Bri Ferrandiz (RBI), Gina Carafa and Sam Tullis also got hits in the win for the Black Knights. Foxboro, 5 @ Sharon, 8 – Final – Sharon junior Clara Cook threw a complete game, collecting 11 strikeouts and allowing eight hits. Offensively, Cook was 2-4 with a first inning RBI triple and a sixth inning RBI single. Senior catcher Rachel Usen and freshman Rebecca Clayman were also also 2-4, each recording a pair of singles. Sharon head coach Deb Parker said freshman Jody Goldenberg played an outstanding game in right field. Franklin, 9 @ North Attleboro, 1 – Final – Maddie Connelly and Alexx Niss each knocked in three runs as Franklin picked up a big win over division rival North Attleboro. Connelly went 4-5 with three RBI while Niss had a three-run home run along with three walks. Olivia DiGiacomo added a two RBI double, Clara DeCarvalho had three hits and Olivia Haba had three hits and an RBI. Caroline D’Aprile picked up the win, going five innings with five strikeouts. Emily Sawyer pitched the final two innings for the Panthers. Oliver Ames, 4 @ Milford, 10 – Final – It was another perfect day at the plate for sophomore Emily Piergustavo, going 3-3 with a double and an RBI. Shannon Cormier went 2-2 with a pair of RBI and Maggie Farrell knocked in a pair and had a triple. Maddy Bonvino was 2/3 with a double and Jess Tomaso was 1/2 with a sacrifice fly. Ali Atherton tossed a complete game, striking out eight. Oliver Ames’ Rachel Han was 3-4 with a pair of singles, a double and two RBI. Victoria Ziner was 2-4 with a double, an RBI and a run scored and Lexie Campbell (1-3, two runs scored) and Jamie Gottwald also scored for the Tigers on Han’s double. Attleboro, 2 @ King Philip, 14 – Final – Ten different players found the back of the net for King Philip, who built a big lead and never let it go. Freshman Collin DeVellis led the Warriors with a hat trick and one assist while juniors John DeLuca and Ben Palmer each netted a pair of goals and had one assist. Freshman Robbie Tartaglia scored his first career goal in the win. Canton, 8 @ North Attleboro, 7 – Final (2OT) – Ben O’Neill scored a team-high five goals, including the game-winner in the second overtime to give the Bulldogs a big league win. The Bulldogs trailed 6-4 at halftime but were able to limit Big Red to just one goal in the second half and overtime periods. Canton goalie Chris Albert was a big reason for that with 19 saves. Joe Mulkay, Dan Dillon and Mike Shaw each scored once and Shaun Kirby finished with three assists for Canton. Milford, 1 @ Foxboro, 25 – Final – Louis Piccolo was in the giving mood on Wednesday, recording a career-high 10 assists in the Warriors’ big win. Piccolo also scored twice while Andrew Whalen scored four goals and had one assist, Trey Guerrini scored four goals and had two assists, Colby Nickerson notched a hat trick and Brian Buckner had one goal and one assist. Mansfield, 7 @ Franklin, 15 – Final – The Panthers built a six goal lead by halftime and stretched the margin to double figures (16-5) by the start of the fourth quarter. Austin Kent led Franklin with eight points, scoring five goals and adding three assists while sophomore Eric Civetti scored six goals and had one assist. Sam Arsenault added a hat trick in the for Franklin. Freshman Jacob Alexander continued his dominance at the X, winning 23/28 faceoffs. Franklin head coach Lou Verrochi touted the play of his defense in front of sophomore goalie Connor O’Rourke (six saves). North Attleboro, 16 @ Canton, 2 – Final – Mackenzie Rosenberg led North Attleboro’s offense with five goals while senior goalie Brooke Ebert played strong with 20 saves in net. Franklin, 18 @ Mansfield, 8 – Final – Julia Jette paced Franklin’s offense with four goals and one assist while Caroline Lounsbury and Annie Walsh each found the back of the net three times in the Panthers’ win. Mansfield, 4 @ Attleboro, 1 – Final – The Hornets swept singles play and won at first doubles to get the divisional win. Benny Lin picked up a 6-0, 6-3 win at first singles, freshman Luke Nickerson won 6-1, 7-5 at second singles and Gus Daganhardt won 6-0, 6-0 at third singles. Mansfield’s final point came from Danny Radev and Sam Cavicchi with a 6-1, 7-5 win at first doubles. Attleboro’s Khaled Hantash and Ahijah Joseph won 3-6, 6-4, 7-5 at second doubles. Sharon, 5 @ Foxboro, 0 – Final – The Eagles won each match in straight sets in a big divisional test against the Warriors. Junior Griffin Fein won at first singles, sophomore Fred Bondar won 6-0, 6-2 at second singles and senior Han Cui took a 6-1, 6-0 win at third singles. Junior Alex Romantz and senior Adam Dobbin teamed for a 6-2, 6-0 win at first doubles and Tilak Mehta and Dahujan Thiru won 6-0, 6-0 at second doubles for Sharon. North Attleboro, 0 @ Franklin, 5 – Final – Franklin won three matches in straight sets and had to battle through to others to get the sweep. Junior Eli Brooks won 6-4, 6-2 at second singles and freshman Dan Barrow picked up a 7-5, 6-3 decision at third singles. James Johnston and Tom Mancini won 6-2, 6-1 at first doubles for Franklin. Junior Rahul Herur had to battle back after dropping the first set to win 4-6, 6-2, 6-1 at first singles. The team of Cam Piana and Jeremy Gan had to the same to get a 6-7, 6-0, 1-0 (10-8) win at second doubles for the Panthers. Taunton, 0 @ King Philip, 5 – Final – King Philip handled business against the visiting Tigers, taking all five matches in straight sets. Cole Ginter won 6-0, 6-2 at first singles, Garrett Schneider won 6-3, 6-0 at second doubles and Blake Ginter won 6-1, 6-1 at third singles. KP’s Sam Colella and Ryan Gemelli won 6-2, 6-2 at first doubles and Justin Rohan and Jake Webster paired for a 6-0, 6-1 victory at second doubles. Attleboro, 0 @ Mansfield, 5 – Final – The Hornets picked up the win in dominating fashion on Wednesday. Paulina Martin won 6-0, 6-0 at first singles and Kathleen Giffels won by the same score at second singles. Sophomore Sarah Doyle won 6-2, 6-0 at third singles. Mansfield senior Cathryn Heavey and junior Chloe Peters won 6-0, 6-0 and freshmen Tessa Garufi and Elizabeth Elsner won 6-0, 3-6, 7-6 (10-8) at second doubles. Stoughton, 1 @ Canton, 4 – Final – Canton swept through singles play and added a fourth win via first doubles against rival Stoughton. Carly Scanlon won 6-0, 6-0 at first singles, Skyler Jabbour won by the same score at second singles and Jude Aboukhater won 6-1, 6-0 at third singles. The Bulldogs wrapped up the win behind a 6-2, 6-1 victory from Tiffany Ha and Sarah MacQuarrie at first doubles. Stoughton’s Becca Lawson and Alyssa McGillicuddy battled back for a 3-6, 6-2, 6-3 win at second doubles. Foxboro, 2 @ Sharon, 3 – Final – Sharon freshman Nupur Shulka won a three set thriller to clinch the match for the Eagles. Shulka dropped the first set but battled back for a 2-6, 6-0, 6-2 win to hand Sharon the win. The Eagles swept doubles play to help clinch the win. Pooja Puttigampala and Katie Merport won 6-0, 6-0 at first doubles and Michelle Cao and Rithica Neti won 6-1, 6-1 at second doubles. Foxboro’s Diana Prinos won 6-1, 6-1 at first singles and Sophia Prinos won 6-0, 6-0 at third singles. Franklin, 0 @ North Attleboro, 5 – Final – The Rocketeers continued their undefeated start to the season with a sweep of visiting Franklin. Julia Mark picked up a 6-2, 6-3 win at first singles, Jordan Willis won 6-1, 6-1 at second singles and Allie Grinavic won 6-0, 6-2 at third singles. The Rocketeers continued to win in doubles play with Jhanavi Kapadia and Emily Chiasson winning 6-0, 6-1 at first doubles and Gabby Duva and Azka Siddiq winning 6-2, 6-2 at second doubles. Oliver Ames, 4 @ Milford, 1 – Final – Oliver Ames swept singles play and notched a win at second doubles to secure the win on the road. Riley Spillane used strong net play to pick up a 6-3, 6-1 win at first singles, Jackie Sulkala’s strong serves aided a 6-1, 6-1 at second singles and freshman Sarah Leger was resilient in a 7-6 (10-8), 4-6, 6-4 win at third singles. OA’s Rachel Stryke and Olivia Groebe won 6-2, 6-4 at second doubles. Milford’s Julie Rabinowitcz and Megan Cafarella won 6-4, 6-3 at first doubles for the Scarlet Hawks. Milford, 1 @ Attleboro, 6 – Final – Senior Tyler Stowe was a spark for the Bombarbiers in the leadoff spot with a pair of hits, a pair of stolen bases and a pair of runs scored. Nate Tellier hit a two run double in the sixth inning to turn a two run lead into a 5-1 lead. Tellier also scored two runs and then pitched the final two innings, striking out five of the six batters he faced. Brent Cook went 2-2 with a pair of RBI for Attleboro. Junior Tyler McGovern made his varsity debut, striking out seven in five innings of work for the win, scattering four hits. Canton, 1 @ King Philip, 8 – Final – King Philip’s Jake Cavanagh tossed a complete game, scattering four hits while striking out 10 batters. Jack DiCenso and Jon Rolfe each had multiple hits for the Warriors. Ryan Coulter knocked in a pair of runs for KP while Cavanagh, Stephan MacMeans and Leo Munafo each plated one run for the Warriors. Foxboro, 0 @ Taunton, 8 – Final – Senior Luke Figueira got it done on the mound and at the plate as the Tigers opened the season with a win. On the mound, Figueira struck out eight batters and allowed just two hits and no walks in five innings of work. At the plate, the senior had a pair of hits and knocked in two runs. Matt Machado and Max Bowden each added a pair of hits and RBI as well. William Emerson had two hits, two runs scored and an RBI and Brendon Mazerolle knocked in one run and had two hits. Franklin, 14 @ Sharon, 1 – Final – Sophomore Jason Ulrickson came on in the fourth inning in relief and pitched four innings without allowing an earned run to get the win for the Panthers. Ulrickson struck out four and scattered three hits. Sophomore Matt Foley pitched the scoreless innings to start the game for Franklin. Offensively, senior Joe Corsi scored four runs, going 2/4 at the plate with a pair of doubles and an RBI. Jake Lyons went 2/4 with two RBI and a run scored, Tyler Gomes had a double and two runs scored, Josh Macchi went 3/4 with a double and three RBI, Jake Noviello was 2/4 with an RBI and Mike Skaza went 3/4 with an RBI and two runs scored. Oliver Ames, 5 @ North Attleboro, 6 – Final – In a game of lead changes, North senior Zach Rofino (2-4, two runs) reached on an infield single to start the bottom of the seventh, advanced to third on a double from senior Brian Poillucci (3-4, RBI, R) and then scored on a base hit up the middle from Brian Kleczkowski (2-3, RBI) as the Rocketeers walked off with the 6-5 win. Ridge Olsen, who was intentionally walked to load the bases in the bottom of the seventh, was 1-3 with an RBI and a run scored while sophomore Zach DeMattio went 2-3 with his second home run in as many games and knocked in three runs. The Rocketeers pitchers didn’t issue a walk all game. Andy Katch went six innings, striking out three while Matt Papineau pitched the top of the seventh to get the win. Oliver Ames tied the game in the top of the sixth when Kevin Geary hit a triple and a single freshman Chris Pearsons. OA senior Chris Romero had three hits in the game and classmate Josh Minuskin had a pair of hits. Attleboro, 0 @ Milford, 12 – Final (5 inn.) – Ali Atherton tossed a one hitter, striking out nine batters in five innings of work while issuing just one walk. At the plate, Jess Tomaso went 3/4 in her debut for the Scarlet Hawks with a pair of doubles and three RBI. Emily Piergustavo went 3/4 with a double and two RBI and Sydney Pounds was 3/3 with three runs scored and a pair of stolen bases. King Philip, 18 @ Canton, 0 – Final (5 inn.) – Elise Pereira, Kali Magane and Jenn Hutnyan combined for one hit ball in the circle for the Warriors. Magane went 2/2 with a triple while Pereira connected for a home run. Freshman Meghan Gorman debuted by going 2/2 with a home run and four RBI while Sydney Phillips also connected for a home run. Senior Christa Wagner scored three runs for KP. Taunton, 15 @ Foxboro, 0 – Final (5 inn.) – Courtney Fisher struck out 11 batters in five innings of work, scattering three hits without a walk to get the win for the Tigers. Taunton’s offense stayed hot behind four RBI from Aimee Kistner (2-4, double), three RBI from Jordan Wade (3-4, double) and a pair of RBI from Liana Duarte (2-4, double). Kya Enos and Meghan Navarro each added a pair of doubles and an RBI and Jaime Brown went 2-2 with an RBI. Franklin, 12 @ Sharon, 0 – Final (6 inn.) – Caroline D’Aprile struck out six and allowed two hits to get the win for the Panthers. Maddie Connelly had a pair of hits, a pair of runs and a pair of stolen bases and Alli Shea added three runs scored and two hits. Clara Decarvalho knocked in four runs on three hits while Julia Arms had a three run home run and Rachel Cousineau connected for a solo home run. Mansfield, 3 @ Stoughton, 4 – Final – Stoughton’s Shannon Flaherty allowed just one earned run in six innings of work to get the win. Flaherty struck out nine and issued just one walk in the win. Mansfield erased a 2-0 deficit in the top of the sixth inning but the Black Knights scored twice more in the bottom half to regain the lead. Jocelyn Reardon had a pair of hits, including a two RBI single in the sixth while Mady Bendanillo, Megan Letendre, Kara Bendanillo and Amanda Giambanco all had a hit in the game for the Hornets. .
North Attleboro, 6 @ Oliver Ames, 1 – Final – Amelia Murphy allowed just three hits in her Big Red debut, fanning four batters to get the win. Rylie Guthrie, Sam Courtemanche and Liz Morehouse each had an RBI single while Kaylea Sherman had four putouts in center field and also a double play. Oliver Ames’ Victoria Ziner was 1/2 with a run scored, Katie Pursley had an RBI and Lexi Campbell also had a hit. Campbell pitched a complete game, striking out five with just two earned runs allowed. Canton, 5 vs. Scituate, 1 – Final – The Bulldogs were able to accomplish a feat not many are able to: shut down Scituate’s offense. Canton only allowed one goal, coming with six minutes left in the game. Defensemen Jake Ragusa, Dan Nadeau, Gabe Galeotos and Jonathan Sutton combined to limit the Sailor while Chris Albert made 16 saves in net. Ben O’Neill netted a hat trick with one assist while junior Ryan Lodge had a goal and two assists and freshman Mike Shaw scored once. Taunton, 0 @ Foxboro, 21 – Final – Andrew Whalen led Foxboro with seven points, scoring three goals and added four assists and Louis Piccolo added four goals and two assists. Brendan Tully had three goals and two assists and Colin Spinney chipped in with a pair of goals and a pair of assists for the Warriors. King Philip, 10 @ Medway, 9 – Final – Senior Sam Agricola scored King Philip’s first five goals of the game to keep the Warriors close and then scored the game winning goal in the third quarter. Agricola finished with six goals, one assist and five ground balls, helping KP take advantage of the extra man opportunities. KP scored on six of their seven EMO while limiting Medway on their special teams chances. Junior Paul Macrina made 23 saves in the game including seven in the fourth quarter. Head coach Jacob Kravitz called it a great character win and credited Steve Eaton’s switch to LSM in the second as a big turning point in the possession game. Tim Watson and Anthony Truini each scored twice for KP. Foxboro, 20 @ Taunton, 2 – Final – Caroline McGreary scored four goals and Sophia DiCenso and Lauren Flahive each netted a hat trick to lead Foxboro. Megan Curran and Lily Feeney each chipped in with two goals for the Warriors. Taunton’s Delaney Powell scored both of the Tigers’ goals. King Philip, 14 vs. Medway, 9 – Final – Katie Crowther was nearly unstoppable, netting a team high nine goals to lead the Warriors. Jen Lacroix added three goals while Abbey Buchanan and Allie Meehan each found the back of the net once. Sharon, 6 @ Oliver Ames, 11 – Final – Oliver Ames senior Hannah Friend made an impact all over the field to lead the Tigers. Friend scored four goals and had one assists while nabbing two draw controls and five groundballs. She also had three intercepted passes for the Tigers. Erin Fitzgerald was another reason for OA’s strong possession game with 10 draw controls. Ariana Waldorf had 12 saves in net while Sofia Masciarelli, Chloe Kikelly and Emalyn Duvall each scored twice. Carly Cidado had a goal and an assist, Abby Duvall had two assists and Kendall Clifford notched an assist for OA. Milford, 2 @ Attleboro, 3 – Final – Attleboro scored wins at first and second singles and sealed the win with a marathon win at second doubles. Timothy Vermilyea won 6-2, 6-2 at first singles and Tyler Letendre picked up a 6-3, 6-1 win at second singles. Khaled Hantash and Ahijah Joseph won the first 7-5 at second doubles but after losing 3-6 in the second, rallied to win 6-4 in the final set. Milford’s Brendan O’Shaunghnessy won 6-2, 7-6 (8-6) at third singles and Tabish Syed and Stephen Donnelly won 6-3, 6-4 at first doubles. Canton, 1 @ King Philip, 4 – Final – KP sophomore Cole Ginter won 6-4, 6-1 at first singles and freshman Blake Ginter won 6-4, 6-3 at third singles to lead the Warriors. Sam Collela and Ryan Gemelli won 6-1, 6-2 at first doubles and Jake Webster and Justin Rohan won 6-3, 6-2 at second doubles for the Warriors. Canton’s Jake Wolicki won 4-6, 6-3, 6-3 at second singles. Foxboro, 4 @ Taunton, 1 – Final – Taunton’s lone win came when Charlie Fiske and Connor Briggs battled back for a 3-6, 6-4, 7-5 win at first doubles. Sharon, 5 @ Franklin, 0 – Final – Sharon won all five matches in set straights to start the season with a win. Griffin Fein won 6-2, 6-3 at first singles, Fred Bondar won 6-3, 6-3 at second singles and Han Cui won 6-2, 6-1 at third singles. Adam Dobbin and Alex Romantz picked up a 6-1, 6-3 win at first doubles and Tilak Mehta and Dahujan Thiru won 6-1, 6-4 at second doubles. Stoughton, 0 @ Mansfield, 5 – Final – Mansfield junior Benny Lin won 6-0, 6-1 at first singles, freshman Luke Nickerson won 6-0, 6-2 at second singles and junior Gus Daganhardt picked up a 6-3, 6-1 at third singles. Sophomores Danny Radev and Sam Cavicchi won 6-0, 6-2 at first doubles and sophomore Ben Salder and junior Stephen Zenack won 6-2, 6-0 at second doubles. Oliver Ames, 1 @ North Attleboro, 4 – Final – North Attleboro got wins from a pair of juniors in singles play and three seniors and one junior in doubles for a 4-1 win. Junior Barsomo Nuay won 6-4, 6-4 at second singles and junior Zack Pfeffer won 6-0, 6-0 at third singles. Seniors Jeff Yao and Nick Lockavitch won 7-5, 6-1 at first doubles and senior Jake Fontes and junior Daniel Zhang won 6-0, 6-1 at second doubles. Oliver Ames’ Thomas O’Leary notched a 6-4, 4-6, 1-0 (10-4) win at first singles. King Philip, 4 @ Canton, 1 – Final – Becca Ricci and Meghan Sepich won at first and third singles respectively to lead the Warriors. Ricci picked up a 6-3, 7-6 win and Sepich won 6-0, 6-0. KP’s elly Masse and Megan Davenport won 4-6, 7-6, 6-2 at first singles and Connie Palumbo and Carly Adams won 6-3, 6-0 at second doubles. Canton’s Skyler Jabbour won 6-3, 7-6 at second singles. Franklin, 2 @ Sharon, 3 – Final – Freshman Nupur Shulka debuted with a 6-0, 6-2 win at second singles to help lead the Eagles to a season opening win. Sharon sophomore Emily Wen won 6-1, 6-2 at third singles and junior Michelle Coo and sophomore Rithica Neti won 6-2, 6-0 at second doubles. Franklin’s Hannah Sweeney won 6-0, 6-0 at first singles and junior Anja Deric and sophomore Katelyn Davenport won 3-6, 7-6 (7-3), 1-0 (10-6) at first doubles. Mansfield, 5 @ Stoughton, 0 – Final – Seniors Paulina Martin and Kathleen Giffels won in straight sets in singles play as Mansfield rolled to a sweep. Martin won 6-0, 6-0 at first singles and Giffels won 6-0, 6-0 at second singles. Sophomore Sarah Doyle won 6-0, 6-1 at third singles for the Hornets. Cathryn Heavey and Chloe Peters won 6-3, 6-3 at first doubles and Tessa Garufi and Elizabeth Elsner won 6-0, 7-5 at second doubles. North Attleboro, 5 @ Oliver Ames, 0 – Final – North Attleboro’s Julia Mark picked up a 6-3, 6-1 at first singles, Jordan Willis won 6-2, 6-2 at second singles and Allie Grinavic didn’t lose a set in a 6-0, 6-0 win at third singles. Jhanavi Kapadia and Emily Chiasson won 6-0, 6-3 at first doubles and Gabby Duva and Katie Demontigny won 6-3, 7-6 (7-3) at second doubles for the Rocketeers. Milford, 1 vs. Millis, 3 – Final – Milford won the third game but couldn’t overcome the 2-0 hole. Senior Mike Haver led Milford with 11 kills and added three blocks. Senior Ryan White had 16 assists, eight kills, four digs, two blocks and an ace while Juan Ruelas had 13 assists, seven kills and three digs and blocks. Attleboro comes into the spring hoping to make a return to the state tournament for the first time since it joined the Hockomock League. Head coach Mark Homer is confident that his team can score runs this year. Senior Sarah Vincent will return as the lead-off hitter and first baseman while classmate and fellow captain Olivia Kass will hit in the two-hole and play shortstop. Catcher Julya Carlson bats third followed by Julia Woyton and Mikayla Harnois, who will see time as the starting pitcher and at third base. The pitching staff got a boost this year with a pair of newcomers – freshman McKenzie Bergdoll and sophomore transfer Makayla Vasquez – who Homer said will see time in the circle. Inexperience in the outfield remains a question mark for the Bombardiers but Homer sees potential for a big spring. For the past few seasons, Franklin has been solidly entrenched as the third best team in the Kelley-Rex division, behind KP and Taunton, and also a team with the potential to make a run in the tournament. This spring, the Panthers will look to sustain that success with a number of new faces. Senior Maddie Connelly returns as one of the team’s leading hitters and is a strong defensive outfielder. She will be joined by classmate Julia Arms and by Olivia Haba, as the Panthers look to fill the void left by Erin Hanley’s graduation. Seniors Caroline D’Aprile and Emily Sawyer will take over in the circle and try to replace Sabrina LoMonaco. In the infield, Olivia Di Giacomo returns at third base and classmate Alyssa DaSilva is back as well. King Philip has long been the team to beat in the Kelley-Rex division and that should continue coming into this spring as well. Led by senior pitcher and defending HockomockSports.com Player of the Year Kali Magane, the Warriors boast a strong lineup and one of the best defensive teams in the league. Senior Ashley Hession will be back as one of the state’s top shortstops and centerfielder Christa Wagner gives the Warriors one of the fastest players in the state. Senior Caeli Bench and junior Jenn Hutnyan will bring experience as well. Mansfield can enter a new season with confidence because the Hornets return senior pitcher Maddie Letendre, who is coming off a season in which she struck out 226 hitters and posted an ERA of 1.41 in more than 138 innings. Letendre will also be throwing to a familiar face, as classmate Brianna Homer will return behind the plate. Outside of that, there will be a lot of new faces for Mansfield with six new starters. Jocelyn Reardon will be back and will play multiple positions this year, as head coach Lori Letendre shuffles a roster that includes a sophomore and four freshmen. North Attleboro is coming off a season in which it won six games, a far cry from a South sectional final appearance in 2014, but this could be a rebound year for the Rocketeers who bring back seven starters. Included in that number is senior Mycala Moody, who only played six games last year due to injury, and will be the starter at short and a big bat in the middle of the order. Liz Morehouse returns at first and the outfield (Kaylea Sherman, Meg Barlow, and Jordan Sharpe) is back in its entirety. Sam Courtemanche will be behind the plate for North to catch returning pitchers Carolyn Wallace and Abby Warren. King Philip transfer Amelia Murphy could be added to the mix in the circle and in the lineup. Taunton reached the Div. 1 South final last season before falling to eventual state finalist Silver Lake. The Tigers bring all but two players (and one starter, Hock MVP Kelly Reading) back to try and make another run at the sectional title. Senior pitcher Aimee Kistner will be back in the circle, with additional help from Courtney Fisher, and adds a power bat to the lineup. Fellow seniors Jordan Wade (shortstop) and Meghan Navarro (second base) shore up the middle of the infield while sophomore Kya Enos will take her speed into centerfield. Freshman Jaime Brown returns at third, Amber Wainwright will be the designated player, and Sarah Bagge will be behind the plate. Sophomore Liana Duarte will step into right field to fill Reading’s shoes. It is a familiar roster and the Tigers are looking forward to familiar success in the league and in the tournament.